This folder contains all of our collateral and infographics that we use at tradeshows and distribute online. WWW.CONVERSICA.COM +1 (888) 778 1004 Successfully engaging a new prospect requires an average of 8 touches. Successfully reengaging a prospect requires an average of 12 or more touches. In organizations with both marketing automation and power dialers, sales reps still make only an average of 3 touches. 35% Their reps become dependent on the dialer and hence less strategic in their touches Sales organizations that use power dialers have a 35% higher "lead at risk" score than those that don't. Prospects are 60% more likely to open an email if it appears to have come from a person And those who do are 55% more likely to respond if the email came from a junior staffer rather than a salesperson. 60% 55% Both B2B and B2C decision makers are 4 times more likely to respond to an assistant than to a sales rep on their first engagement. 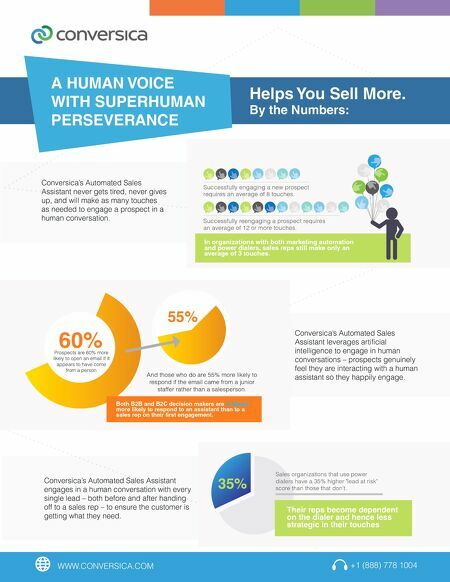 A HUMAN VOICE WITH SUPERHUMAN PERSEVERANCE Helps You Sell More. By the Numbers: Conversica's Automated Sales Assistant never gets tired, never gives up, and will make as many touches as needed to engage a prospect in a human conversation. Conversica's Automated Sales Assistant engages in a human conversation with every single lead – both before and after handing off to a sales rep – to ensure the customer is getting what they need. Conversica's Automated Sales Assistant leverages artificial intelligence to engage in human conversations – prospects genuinely feel they are interacting with a human assistant so they happily engage.